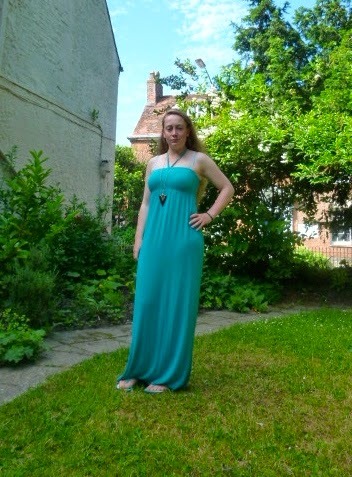 Summer Styling: The Maxi Dress - CounterCultural. CounterCouture. Style Notes|| Maxi dress: Republic, Necklace: New Look, Flip flops: One of the many camping shops in Keswick. Can you believe this sunshine? It’s been gorgeous for a week now and I am loving it. Saying that, I did manage to get my forearms burnt at work yesterday but it’s to be expected working outdoors. As I wear fitted shirts and trousers for work, I’m taking days off as a chance to wear clothes that don’t constrict. And when it comes to simple, unconstricting outfits, the maxi dress wins every time. This particular number is my favourite (and currently the only one I can wear) and cost me dear. While I did buy it in a summer sale in 2012, I was also a student at the time with barely any loan left and no summer job. I don’t miss those days at all. I love the aqua colour. My flip flops match perfectly and are soooooo comfy! That’s what you get for spending £20 (1/2 price in a summer sale!!!) in a camping shop. These flip flops were made for walking. The combination of the dress and flip flops is perfect for summer in rural towns. From running errands, getting my lashes tinted (here) to blogging, the maxi dress cannot be beaten for comfort. And the best bit is, I can easily up the glam factor. The correct shoes, jewellery and accessories can all change the feel of a maxi dress. And if we’re honest, there is nothing more glam than a florr-sweeping frock. And what do you think of the necklace? I like the edginess of the shape but I’m not convinced that the black goes with it. Too much of a contrast? Sunshine… fab for a tan, not so much for taking photos. While we’re on the subject of maxi dresses, I want to tackle to topics linked with this most glamorous of dresses. Firstly, festivals! Who on earth ever thought it would be sensible to wear a full-length dress in a field full of mud and probably used for animals a few weeks before?!?! I tried this last year. Wasn’t at a festival but the campsite I stay on while the Keswick Convention is on. Wearing a maxi in a sheep field with long grass just isn’t sensible. So what do you wear? I’m going to be addressing that question in depth soon but for now remember this word… MIDI! Yes, the on trend midi-length is your festival/camping saviour as, surprisingly, it doesn’t trail through muddy, grassy fields. So keep the maxi for civilisation and stick with the midi for your camping needs. The second issue is that of modesty. The maxi’s length means that being strapless is not immodest as the shoulders are balanced out by the covered legs. The only issue is, if like me, you can’t stand strapless bras you have to have straps on show. Having underwear on show- I’m sorry but lingerie is underwear- is a big no-no on the modesty front but if the straps co-ordinate or are flesh coloured then it’s a slight improvement where necessary. On this occasion it is necessary and my straps are a lighter shad of aqua so don’t look out of place. Effectively, when wearing strapless, keep all the attraction on outfit and balance out bare shoulders with covered legs. So they’re you have it. Why I love maxi dresses. Why they are a no-no for festivals. And how to make a strapless dress modest. How about you? What’s your take on the maxi dress?